The fourth week of Short+Sweet’s Sydney festival opened tonight, and it was an opening I could hardly wait for. My play, The Commuter, is in this week’s line up, so it was always going to be an exciting night. It surprises me how deep the emotion runs of seeing my vision for a play realised on stage. The cast Luke Berman pulled together for The Commuter gave me one of the greatest buzzes I’ve experienced in a long time, and I think Adam O’Brien captures beautifully the nervous white guilt phenomenon I was exploring in this play. It doesn’t wear off, that cathartic feeling of seeing something you imagined into existence come to life on stage, and I feel truly indebted to these performers for the work they’ve put into the play. I knew Geoff Sirmai from his performances in Canberra of Joanna Weinberg’s Every Single Saturday, and was very pleased to see him deliver the American Tourist in The Commuter with such great energy. Charlotte Connor admirably balances the manic and focused nature of the mother, and Nik Nikitenko is amazing as the eight-year-old boy whose instincts spark the commuter’s catharsis. I have something of a bias perhaps, but I think The Commuter is a great way to end this week’s Short+Sweet offering. It is preceded by some excellent plays, particularly Jilted, which starts the second act. Kerrie Spicer’s script is hilarious and it is delivered with great timing by its cast. Sarah Knowles in particular should be commended for the difficult task of delivering her character’s pathos honestly enough for Sam Smith’s humour to shine. I was also particularly taken with Hide, a very dark comedy that blurs notions of shelter and protection, in which Laura Holmes and Chris Miller keep the audience on edge for just the right amount of time (which in a ten-minute play festival is probably about nine minutes). Josh Hartwell’s script for A Different Client is both raw and heart-warming, which is a rare and challenging combination, and Greg Wilken and Roberto Zenca have drawn Hartwell’s characters out wonderfully. But nothing outshines the joy of seeing my script come to life again, and its position at the end of the evening just adds to the pleasure of seeing the thing realised. This week’s offering from Short+Sweet runs til Sunday, and there are four more weeks of short plays before the Gala Finals in March. Bookings and more info from Short+Sweet. I’ve just been to see Les Misérables and it seems the angst-ridden trailers that I’ve seen everywhere for this film would have been sufficient. It seems the marketers were given very little to work with and all the best bits of the film were used in the trailer, so there’s not really a need to pop along and see it. I really hate to say it, but it’s the Australasians that let the film down (yes, New Zealand, when he does badly, Russell Crowe is a Kiwi; we’ll only claim him as an Aussie when he does well). Hugh Jackman is a little awkward but tolerable; the problem is that whenever he’s on screen, I’m seeing Hugh Jackman do Jean Valjean, rather than seeing Jean Valjean. The awkwardness with which he carries the role just undermines the suspension of disbelief. I fully concur with those who have criticised the choice of Russell Crowe for the role of Javert. He is not entirely inappropriate, but it seems that although he can hold a tune, he can’t hold both a tune and a character at the same time. I believe he could have carried the character well enough were this not a sung-through musical, and I also have a feeling that there is scope for a film version of Les Misérables adapted to prose rather than the musical, which doesn’t really do the story any favours. The film does have a few redeeming points, though. Whenever Anne Hathaway is on screen, I forget the awkwardness of Jackman and Crowe; she is engaging and poetic in every sense. Edward Redmayne is likewise convincing as Marius, and his chemistry with Amanda Seyfried‘s adult Cosette is palpable. Along with Isabelle Allen, these performers almost manage to redeem the film from the clunky performances of the two Australasians commanding the big dollars. 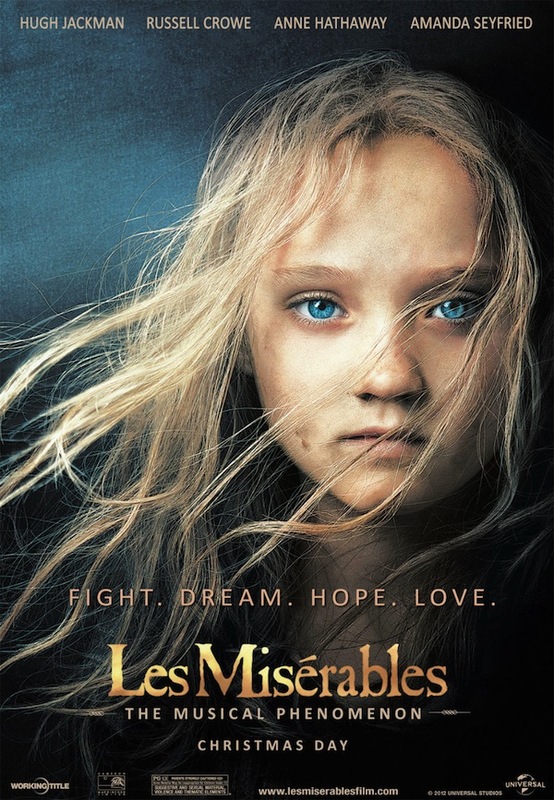 Whatever its faults, this film does one thing particularly well, in my opinion; while most productions that I’ve seen, whether for stage or screen, position Les Misérables as a quintessentially French story, this film sets the story amidst the mere backdrop of revolutionary France, allowing the characters greater autonomy from their political circumstances. It is my opinion that the story would sit just as well in front of any struggle for independence and liberty. It would be as at home before the Battle of the Chesapeake, the Eureka Stockade, the Myall Creek Massacre or Tiananmen Square, because the focus in this story is the journey of the individual characters within a particular political context. And of course, this being a story originally written by a Frenchman, its French context is de rigueur. And perhaps that’s the big thing to learn from this rather expensive mistake of a film. What the world needs is an adaptation that takes the story of Les Misérables and depicts some fictional Aboriginal characters going through the same experience in the lead up to the Myall Creek Massacre… with prose dialogue to ram home the point. I’ll take that one. Anyone want to pick up Tiananmen Square? Few theatre-goers will struggle to relate to the experiences of bullying the protagonist of Fag Boy and the Married Guy recounts for audiences at La Mama over the next few days. This is a strongly developed story that explores – not terribly subtly – both bullying and the gay dating scene. So my first venture into a theatre in 2013 ended better than it began. Have you ever tried to find King Street Theatre in Newtown? Talk about hidden away; it’s not even on King Street! But I made it, on time (which is more than can be said for some), and the hunt for the theatre turned out to be a real treasure hunt. So this first week of Short+Sweet Sydney for 2013 started with a lot of energy. Pete Malicki’s Checkout is a little preachy perhaps, but nonetheless engaging and its four performers delivered Malicki’s strong characters with integrity, making for a strong start to the evening. I was impressed by Kerry Bowden’s monologue Handyman, which has forever given me a new (and improved) association for the Bunnings jingle. Emily Kivilcin hit just the right note between ditzy and cunning, which I’m not sure is a note I’ve ever heard before. Miranda Drake delivered an impressive monologue also, and though its focus was a distinctly female experience, I was impressed with the manner in which it engaged male audients in the female perspective of the experience. Though there was a lot to like, the two greatest moments came immediately before and after interval. The last play before interval was My Name is Cine-Ma, which was devised by Stray Factory and has been awarded in the Mumbai, Chennai and Kuala Lumpur Festivals. Taking the Bollywood tradition as its inspiration, this energetic piece focused on the story of a girl who was a little too obsessed with film. Somewhat reminiscent of the Chooky Dancers in flavour if not style, the exotic and prosaic sit hilariously side by side, which always tickles my fancy. The Fox and the Hunter, though, is a truly inspired piece of theatre. Taking the mickey out of English sacred cows always gets me laughing (see what I did there? ), but I think Simon Godfrey’s script is a work of pure genius, taking the moment when a clever fox meets the hunter who has pursued him for an eternity, and exploring just what happens when gentlemen and foxes engage in a truly meaningful dialogue. It rides splendidly on the talents of James Hartley as the pompous hunter and Tom Green, whose fox genuinely inspired the willing suspension of disbelief. If you haven’t been to see Short+Sweet Sydney 2013 in week one, it’s too late and you’ve missed out, but don’t despair; there are several more weeks, including the presumably perfect week 4, when my play The Commuter gets another airing.